So I've developed lots of ways to use up the little bits of chicken meat. 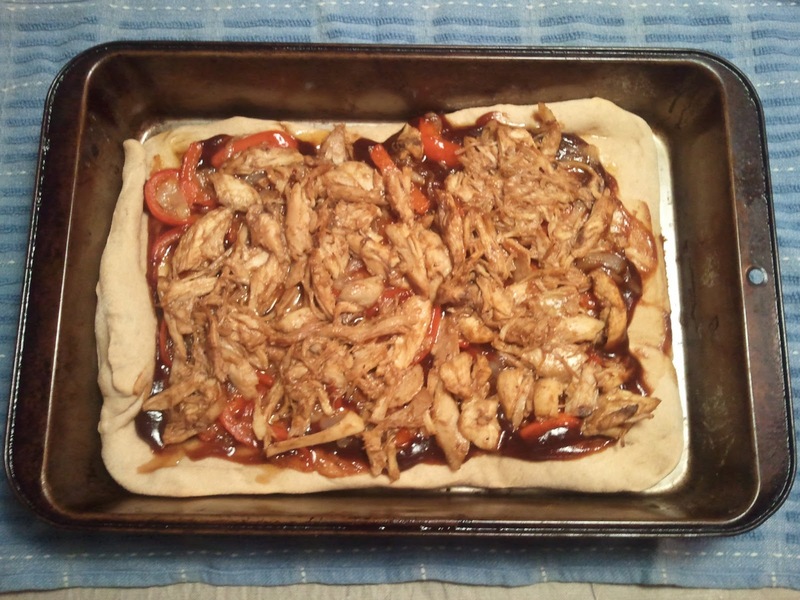 Here's one of them I did a few weeks ago - barbecue chicken pizza! Make the pizza dough according to the recipe. Roll the dough out into two 9x13 rectangular pans. Prebake the crusts at 450 degrees for 6 minutes. In a large saute pan, heat the olive oil over medium heat. Add the onions and saute, stirring, for 3 minutes or until translucent. Add the red bell pepper and saute, stirring for another 2-3 minutes. Add the garlic and saute for 1 more minute, taking care not to burn the garlic. Bake at 450 degrees for 6 minutes. Allow to cool for a few minutes, then dive in! There are lots more easy and cheap recipes posted here at Frugal Follies. Click here for the list! Got a great frugal recipe? Link below to your actual post, not your main page. Please only link up recipes and other food-related posts. I'd appreciate it if you would link back to Frugal Food Thursday as well! If you have a linkup party that you'd like me to know about, please leave a comment below. Want to find more places to link up your recipe or to find more great recipes? Please go to my Linkup Parties list and scroll down to Food Linkups. There are lots of great recipes on each blog and I'm sure you'll find some new favorites! Saw this on the Foodie Friday Link Party. It looks so good. Such a great way to use left overs. I bet kids love it too! I can see my teenage son making this for his friends. Thanks for sharing it on foodie friday. Your Bar B Q Chicken looks awesome! Thank you so much for celebrating TWO YEARS with FULL PLATE THURSDAY, I appreciate your visit! What a wonderfully delicious way to use up leftover chicken! Your pizza looks scrumptious. I love your Barbecue pizza idea! I have shared it in a round up of ideas for using up leftover barbecue chicken on my blog today.